Located in the hills about 10 km north of Cannes on the French Riviera is one of the regions most beautiful villages – Mougins. This medieval village is steeped in history and is positioned amongst pines, olives and cyprus trees and encircled by forests (the Valmasque forest covers over 400 hectares). Mougins village has kept much of its olde world charm and with an altitude of 260 metre offers the visitor the most amazing panoramic views of the Baie de Cannes and inland towards Grasse. Like most of the villages within this region of the French Riviera, Mougins and its few full time residents have worked hard to make sure as a tourist to Mougins, you will not be disappointed. Everywhere you look you will be charmed by the buildings, flowers, snaking side streets and be amazed at how the houses have been kept in such good order. The colours and textures of the buildings are elegantly complimented by incredible arrays of Mediterranean flowers throughout the village of Mougins. These aesthetics in the village have given rise to a large gathering of almost 20 art galleries and studios within the village all offering a myriad of unique creations and products. Much of the centre of the ‘old’ village of Mougins dates back to the 11th and 15th centuries. In the 11th century the Count of Antibes gave the Mougins hillside to the Monks of Saint Honorat. During this period, Mougins was a fortified village surrounded by ramparts and parts of the medieval city wall still exist as well as one of the three original ancient gate towers (Porte Sarrazine). During the 18th century War of the Austrian Succession, the village was plundered by the Austro-Sardinian armies and damaged by fire. Following this, some of the ramparts were deconstructed and several new little streets of early 19th century houses were built. During the 19th and early 20th centuries, the village was a centre of floral production producing lavender, roses and jasmine for the perfumeries in nearby Grasse. Mougins is still a living village, where both the ancient buildings and the 19th century houses are inhabited as they have always been. Althoug many properties are given over to studios for artists. 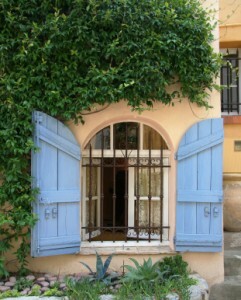 The melange of the colours in Mougins emphasised by the Mediterranean skies has seduced many artists and celebrities who have chosen to stay or live in Mougins, including Picasso, Winston Churchill, Christian Dior, Yves Saint Laurent, Catherine Deneuve, Edith Piaf and Jacques Brel to mention but a few. Mougin’s close ties to the celebrity, art and cultural world is also due to a strong gastronomic history coupled with the quality and choice of villas and luxury homes available to buy and rent within a short distance of Mougins village. Pablo Picasso spent the last 12 years of his life living in Mougins (1961 to 1973), where he eventually died. He lived in a ‘mas’ (farmhouse) at Notre-Dame-de-Vie, which is a small hilltop just beside the old village of Mougins and next to the 12th-century chapel of the same name. Picasso’s studio was in the old village that is now used as the tourist office. While the studio of Fernand Loger was above what is now the village wine shop, next to the rear of the Mougins Museum of Classical Art (MMoCA). Mougins has a long history with gastronomy and is home to many superb restaurants; great chefs such as Roger Verge and Alain Ducasse having both managed restaurants in Mougins. Both were synonymous with the restaurant L’Amandier, which is situated in the heart of the old village. This restaurant still exists today and is housed in an historical building – during the Middle Ages this was the court house of the Monks of Saint Honorat, before becoming an almond mill in the 18th/19th centuries. Denis Fetisson, who received the Jacquart Trophy for the Rising Star in Gastronomy in 2006, now manages L’Amandier and is also the manager and head chef at La Place de Mougins (previously Le Feu Follet, regularly frequented by Picasso) which is another important restaurant in the heart of the old village. Last but not least is the Moulin de Mougins probably the most famous restaurant in the area of Mougins and heavily frequented by the stars during the Film Festival every May. The French Riviera and villages such as Mougins together with the coastal towns of Cannes, Antibes and Nice have long been a retreat for Parisians and other northern Europeans taking a weekend breaks from the hustle and bustle of city life being just an 1 – 2 hours away by plane from most European hubs. This region has also been a firm favourite with the British for many years and the ever increasing flights into Nice International airport have made a second house on the French Riviera more accessible for many UK residents. The laid back lifestyle, more than 300 days of sunshine per year and the varied lifestyle, gastronomic cuisine and cafes of Mougins are the perfect winter retreat. The warm Mediterranean climate on the French Riviera means that you are almost guaranteed sun (and blue skies) all year round. Summers are hot, with maximum temperatures hitting the high 20′s or quite often more. Even winters are quite mild and you could be sitting in a quaint cafe in Mougins in bright sunshine sipping a delightful glass of rose from a provencale vineyard in any winter month. If you’re looking for luxury houses on the French Riviera, Mougins property offers everything you could wish for. Only 25 minutes from Nice airport, 20 minutes from the beaches of Cannes and during the winter months you can be on the snow within 60 minutes. There are many privately gated domains or single houses in Moungins within a wide range of prices to suit every budget.